However, diamond blades are also highly specialised pieces of equipment, and their storage and cleaning requirements can be quite different to those of traditional steel or titanium-tipped blades. Do your best to adhere to the following general guidelines, which should help you get the most out of your diamond blades. If possible, always hang on to the boxes and packaging your diamond blades came in. These boxes are designed to protect the brittle edges of your blades from a rough-and-tumble journey through the postal service, and are therefore more than capable of protecting blades kept in stationary storage or the back of a work vehicle. However, if the original packaging is nowhere to be found, you can still store the blades safely and effectively. Traditional tool pegboards are surprisingly well-suited to this task, as they keep the blade elevated and away from hard surfaces that can dull or shatter the relatively fragile diamond edge of the blade. Pegboards are also particularly useful for operators or businesses using a wide variety of diamond blades, as their open layout allows you to quickly locate and obtain the specific blade you need. Ordinary tool drawers can also be a useful place to store your blades, but if you choose this option, it is vitally important that your blades are fixed in place inside the drawer. Unsecured blades can slide and shift as a drawer is opened and closed, causing the edge of the blade to hit the interior of the drawer. This secure feature is particularly important when using mobile or vehicle-mounted tool drawers. You should also pay attention to the room or vehicle the blades are located in. If at all possible, this space should have a controlled climate—humidity is the great enemy of a long-lasting diamond blade and can provoke corrosion and rust that can fatally undermine a blade’s strength and durability. Something as simple as a dehumidifier, or even silica gel packs inserted into your boxes or drawers, can help keep humidity at tolerably low levels and prevent rust from accumulating. If your business routinely uses ordinary metal cutting blades, you might think that the cleaning techniques you use can be applied to diamond blades. While metal blades can be cleaned with harsh cleaning chemicals, sponges and brushes, diamond blades can suffer terminal damage if exposed to these cleaning materials. Cleaning chemicals in particular should be avoided, as they can weaken the bond which adheres the diamond edge to the main body of the blade. All you need to properly clean and sharpen a diamond blade is an ordinary concrete or cement block, even something as simple as a breeze block or paving stone. Running a diamond blade at full speed against the surface of the concrete will dislodge any accumulated debris or particulate matter and should be undertaken both before and after your blade is used. As you run the blade against the concrete, make sure to change the angle of the blade at regular intervals, as this change in direction will also sharpen the blade and remove any protruding pieces which may undermine your blade’s efficiency. However, while concrete is all you really need to keep a diamond blade in working order, water-displacing lubricants can also be useful. These lubricants will help prevent rust from accumulating on the metal body of the blade and will also decrease friction between the blade and the equipment it is fitted to. 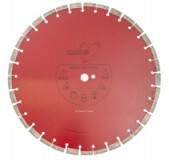 Use these tips to extend the life of your diamond blades. If you have any questions, contact Crozier Diamond Tools.